J&M are the premier house washing and pressure washing company in Waterford and White Lake. So if you live in Waterford or White Lake why would you get professionals in to clean your house or footpaths or driveway? When it comes down to it the look of your home reflects on your reputation. People who keep their homes and surroundings clean and tidy raise the dignity of their whole area. You may think that house washing and jet washing are essentially the same thing but that is not the case. 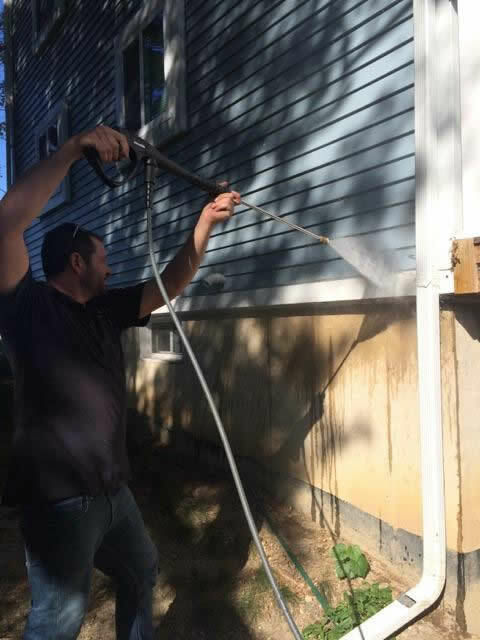 If you pressure wash your siding you might cause damage to the paintwork, if not to the material it is made of. If your house or business is faced with concrete or metal cladding it is still not usual to power wash. Again power washing can be too violent and soft washing is likely to be more appropriate. A professional house washing company like J&M will know exactly what is right for your home and will always do a great job. House washing usually needs doing about once per year but it depends on the area you live in. If you are overshadowed by trees you might find that algae and moss growth mean that it needs cleaning a little more often. Soft washing can preserve the look of the house and can mean less expensive maintenance. Pressure washing comes into its own on driveways, decks and footpaths. J&M offer professional power washing services all over the Waterford and White Lake area for domestic as well as commercial customers. In fact we believe that J&M are the best pressure washers Waterford and White Lake have to offer. Check out our special offers: if you have your house washed and your gutters cleaned at the same time you can get a fifteen percent discount. Both jobs will need doing so why not have them done together and save money? J&M will happily give you a free quotation and we are confident not only that you will like our prices but that you will love the finished job. Also we are sure that you will be happy with our power washing prices. Whether your driveway is concrete, stone, tarmac, or paving slabs, our operatives have the expertise and will do the best job possible whilst respecting the environment wherever they can. They will be as quick and efficient as they can without sacrificing the quality of the work. We at J&M are happy to clean commercial premises, washing the frontage and cleaning the driveways and footpaths. We have all the right equipment and know what is needed to enhance the look of your building and make it more attractive. We are well trained in safety issues, guarantee all of our work and are sure that our competitive quotes will make you smile.